With a large a varied entry of plants for the 2017 accolade there was stiff competition this year. The range of plants included edibles, as well as seasonable bedding and shrubs, all of which were exhibited to the public for the first time at the show. Judging looked for novelty, originality, horticultural excellence and real impact in the specimen entered. 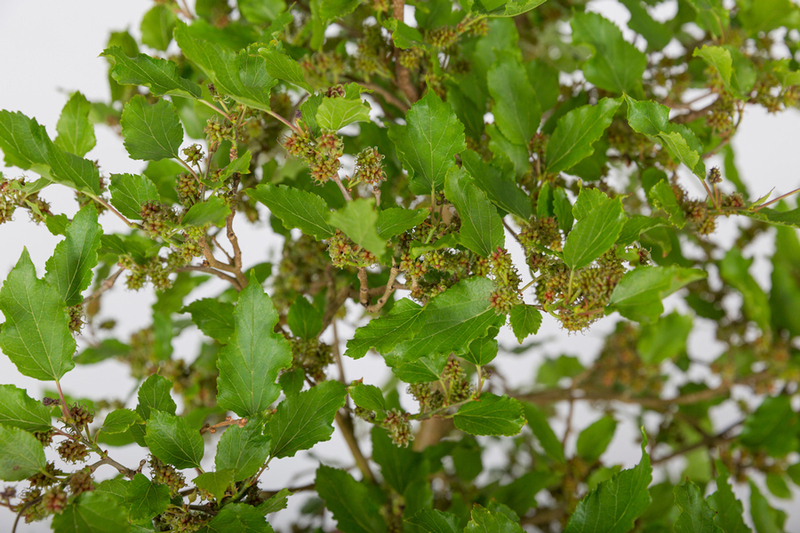 It has taken 40 years for Japanese breeder Mr Matsunaga to create this unique Dwarf Mulberry Bush that is compact with tasty berries, fruiting over a long season. Some 30 years of hybridizing culminated 10 years ago and since then the plants were propagated in Japan before coming to Europe, where they have been propagated into commercial quantities and introduced onto the UK marked by Suttons. The unique compact form is ideal for small gardens or even pots and it will fruit in its first year from June to September on new and old wood. 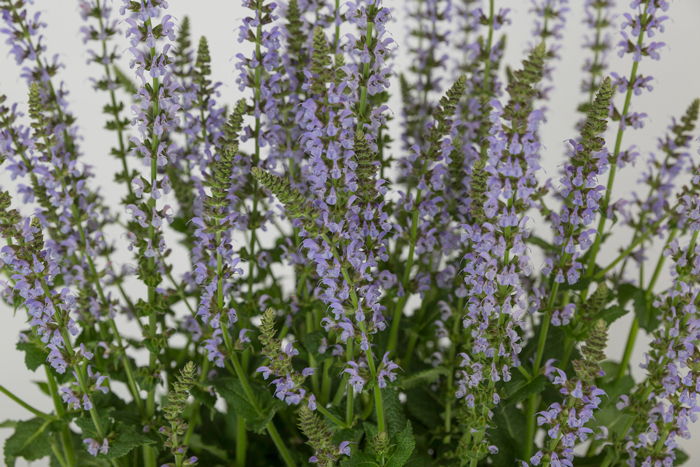 The runners-up were Salvia ‘Crystal Blue’ with a light sky-blue flower. (above) A chance seedling found in a field of salvias in Michigan, this hardy perennial was also on show on the Hardy’s Cottage Garden Plants stand. The pastel blue colour of the flowers blends well with other plants and it grows to a height of 45cm with 60cm spread. Third place went to Hibiscus rosa-sinensis HIBISQA PETIT ORANGE (‘Petit Orange’) exhibited by Thompson & Morgan. 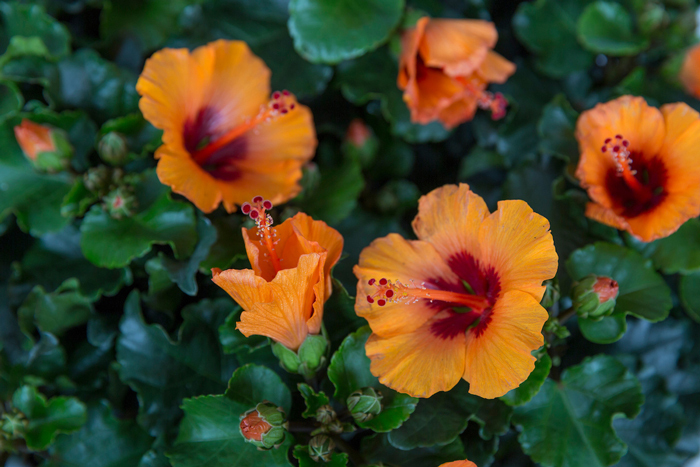 (above) Adding an exotic feel to any windowsill or patio, this floriferous Hibiscus has eye catching orange flowers contrasting with a shiny, dark foliage. It can be grown outside in a warm, sunny position where it will flower from May. 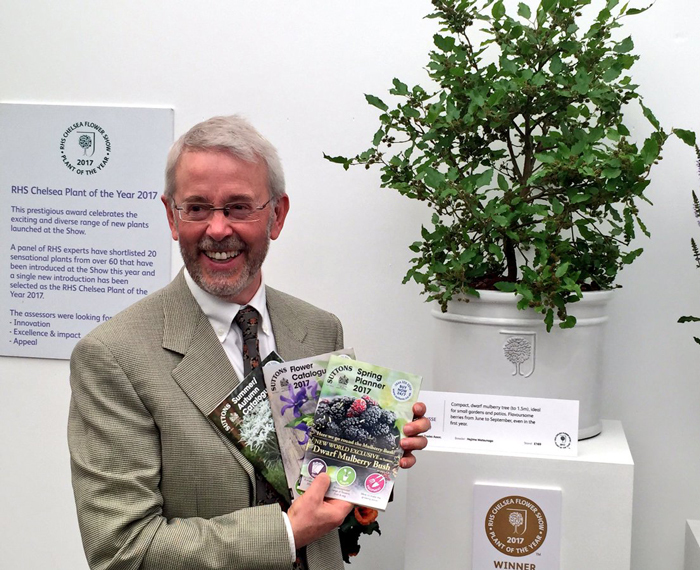 Photo top middle: Suttons MD David Robinson with the winning Dwarf Mulberry Bush, Charlotte Russe ‘Matsunaga ©Suttons. All other pictures ©RHS Image Library.